If you have a big garden or a lawn that looks dry and splotchy, you probably know that maintaining them is a tough task. To achieve that curb appeal and to make your job easier, a lawn feed spreader will come in handy. Lawn spreaders are the most efficient and the most effective tools for lawn maintenance. They help you make the task of spreading seed faster and they also help you to consistently apply the seed throughout the lawn. There are several aspects to take into account before investing in a lawn feed spreader. They come in different styles, shapes, and sizes and also have different features. Some lawn spreaders are designed specifically for small gardens while others are more suitable for large lawns. In addition, there is always that well-known challenge of choosing one garden spreader from so many different brand names, features, and range of prices. When choosing the best lawn feed spreader for your needs the most important thing you need to consider the nature of your own lawn. Our top 5 best lawn feed spreader reviews will help you make a final decision and find the best fertilizer feed spreader for your needs. Spreading width ranges from 122 cm to 340 cm. Has a convenient, hand-regulated on/off switch. Handlebars are adjustable and provide comfortable use and storage. Comes with variable settings that apply to lawn food or grass seed. Should be used with Scotts Lawn Builder, Evergreen and Miracle-Gro granular lawn care and/or grass seed products only. Some users stated that the wheels break easily and that the fertilizer has to be pushed through the hole when it is near the end. 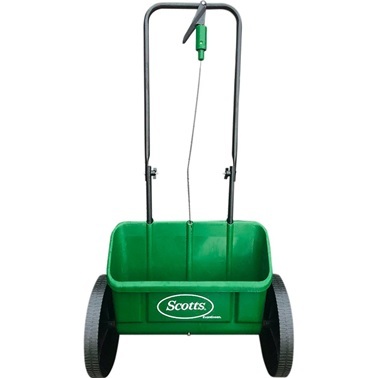 If you are looking for the best lawn feed spreader in terms of affordability, then Scotts EasyGreen Rotary Spreader is the right choice for you. It comes pre-assembled, so you need only basic DIY skills to get it working. This spreader can spread feed effectively and efficiently. In addition, it is very easy to use. On the back of the bag is the rate control. All you have to do is choose the appropriate setting and start walking. Also suitable for large lawns as well, since it has a spread width of almost 3.5 metres. The convenient on/off switch on the handle bar allows you to stop the spreader when appropriate. The manufacturer recommends using this product with Scotts Lawn Builder, Miracle-Gro and Evergreen lawn care and/or grass seed products only. However, the spreader will work perfectly fine with any make of grass seed products and fertilisers. Comes with a sophisticated dispensing mechanism. Has a convenient on/off switch. Users complained that the wheels tend to become jammed easily. Perhaps not the best lawn fertiliser spreader, but for a cheap yet effective one, you should take EverGreen Easy Spreader Plus into consideration. Very easy to assemble and it is ideal for medium-sized lawns or gardens. The spreader is lightweight and its size is adjustable so everyone can use it comfortably, regardless of their height. There is a reason why this spreader is called Easy Spreader. It has an advanced dispensing mechanism that ensures no product escapes. In addition, it comes with information about the different settings and helps you determine which one is suitable for the kind of seeds you are using. The settings are adjustable and give you total control over the spreader. Has 50 lb (23 kg) capacity. Maximum spread width is 3m. Comes with pneumatic tyres and enclosed gearing. The handle bar is made out of steel and has a powder-coated frame. Assembly is required for this product and many users found the process to be a bit complex. For all those who are in need of a sturdy spreader, the Handy Wheel Push Lawn and Fertiliser Spreader is a good choice. It has 50 lb capacity which is suitable for medium-sized lawns. 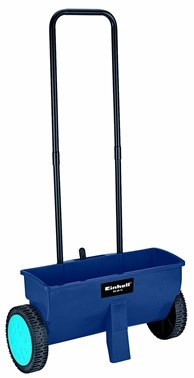 This spreader has a variable flow rate which the user can control easily from the top of the handle. Unlike many other spreaders, this garden spreader has pneumatic tyres which make it easy to manoeuvre this spreader. They are also great for taking on slopes. Has a convenient on/off switch that prevents the unwanted drop of grass seed and fertiliser. Comes with adjustable settings which ensure even distribution. 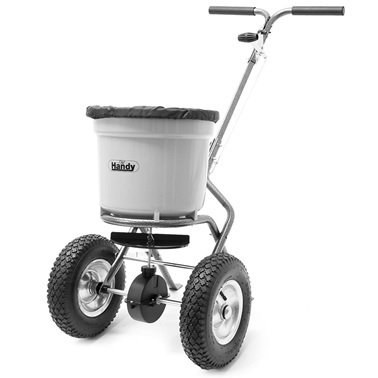 The spreader is easy to push and has large wheels for reduced marks on the lawn. Spread width is very wide – 18 inches. Vulnerable to corrosion and requires thorough maintenance on a regular basis. 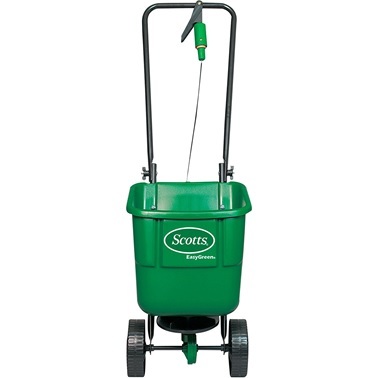 Another great lawn fertiliser spreader by Scotts is the Miracle-Gro Drop Spreader. It has variable settings which allow you to choose the appropriate rate for different products and ensure even and precise distribution of products. Adjustable handlebar, making them suitable for every gardener regardless of their height. In addition, the spread width of this product is 18 inches. Can hold up to 12 litres of product. Has mutual spring lock for convenient storage. Corrosion-proof roller ensures additional protection. No on/off switch. Also, the assembly instructions are only in German. 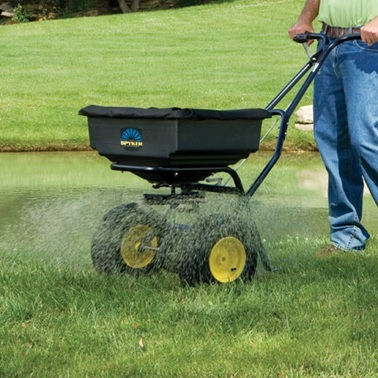 It is hard finding a robust yet relatively lightweight lawn feed spreader. That is where the Einhell BG-SR Manual Multi-Purpose Spreader comes in. 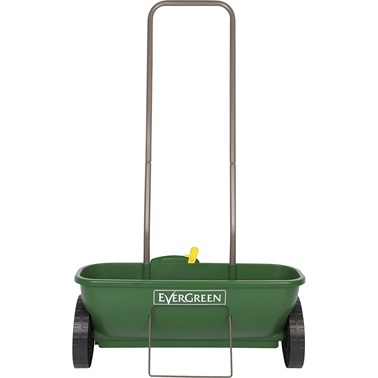 It weighs only 2.6 kg and the double push bar makes it easy to guide this spreader around your lawn. The spreader has an adjustment lever on the back of the container which allows the user to regulate the spread rate. Container of this lawn feed spreader is made out of impact-resistant material and the roller is weather-resistant and corrosion-resistant as well.